Several of the leading UT2004 servers use the Llama Punter Network to clean up their server from known aimbotters and hackers. While we are not 100% effective, we help stop a great deal. 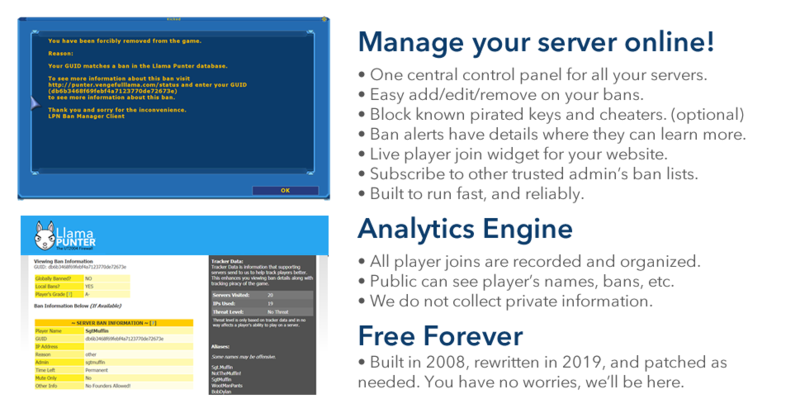 Our tracker system has collected hundreds of thousands of records to help you track impersonators, pirated keys, or bans from other servers. Nearly all features are optional for server admins. If you don't want to use our global ban list you don't have to, you can also just not subscribe to any bans and just help report player joins and analytics to our system. You can also add exceptions if you want to allow a certain key that's on our global block list. Used to be on UTAN? You'll recognize so many features still here for you. Instead of the Traq system where you had to wait up to 10 minutes (and more), you can get results instantly. Users are able to search without signing up also. Admins can also search our powerful Tracker Database with TrackerTools, included with all accounts. Just like UTAN was, we have Global Bans, Server Bans, etc. All UTAN bans were ported over upon launch of our project in 2009. We believe in UT2004 as a strong community, however we still feel that cheaters will continue to do what they do best, "Pretending" they have skill, and living a very pathetic life of self loathing and depression.